1 Let’s begin by getting your skillet nice and hot over medium heat. Pour a bit of olive oil and throw the onion in. Cook until the onion is translucent before adding the longganisa meat next. Stir and break the pieces to a crumble and cook until brown in color. 2 Once that’s done, you may pour in the milk and Knorr Pork/Beef Cube and just allow this to boil once then simmer for 2-3 minutes only. Just leave it in the pan to cool slightly. 3 Let’s continue by preparing the casserole. In another bowl, whisk together the eggs, mustard, Italian seasoning and half of the grated cheese. Now, drop in the bread with the potatoes, green bell pepper and the longganisa mixture. Just give this a dash of salt and pepper according to your preference. 4 Our dish is almost done. Just transfer the mixture in a baking dish, cover with the remaining cheese on top and bake in a 350F pre-heated oven for 30-40 minutes. Just add chopped spring onions on top and that’s it! This dish is done! 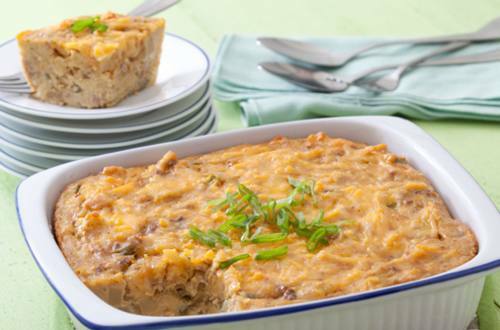 5 Taste and see what we mean when you try this Longganisa Breakfast Casserole Recipe. You will definitely crave for more.